So Farmer came to be. Farmer is a wonderful, inspiring example of how people can pull together in tough times. We have enlisted the help of some of Australia’s most talented chefs, foodies, recipe writers, photographers, stylists, designers and editors, who are generously donating their time to bring this stunning book together. 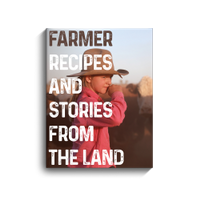 Our talented team of photographers and writers of the food industry, traveled all over Australia interviewing farmers and producers about their love, the land. With each yarn we dug deeper, building lasting friendships and walked away changed; empowered with knowledge of the farmer's place, their land and with recipes that have been hoarded for generations. Food celebrities have jumped at the chance to do their part and give something back to the farmers. Every single person who has contributed to this book has done so for free so that all proceeds from book sales can will directly benefit farming families in need. We are determined to work with an organisation making a positive impact in the most financially transparent way and this led us to the Country Womens Association of Australia. The CWA supports farmers by providing up to $3,000 into their bank accounts for household items, rates, bills, medical and dental bills, education, vehicle maintenance, food and expenses that are current and outstanding. One of the main reasons we selected the CWA is they have no adminstration costs so all of the money we donate to them will go directly to farmers in need across Australia. Our initial target was $60,000 but thanks to the outpouring of support we have decided to double this and reprint the beautiful book if required. We will do our best to ensure all our hard work and your generosity really does make a difference to farmers and their families. We would love to sell over five thousand books - but we have every confidence that our beautiful book will reach that target AND BEYOND! Normally, a book of this size and quality would cost over $100,000 to produce, but this passionate team are donating hours and hours of time, skills and resources to make this happen. The only costs that we can't avoid are printing and postage. $10 is going to postage and approximately $6 per book for printing. This means every purchase of a $30 book sends $24 towards the farmers. Want to show the farmers that you care? Want to be inspired and learn about where the food on your plate comes from? Pre-order your copy of Farmer right now! We look forward to sharing these beautiful stories and recipes with you and your family. We had originally expected hard copies of Farmer to be delivered from 1 February 2019. Farmer is a tribute to Australian farmers who are in the midst of one of the toughest droughts in a century. Food lovers, producers, and chefs have united to create a beautiful cookbook celebrating stories from the land. FARMER WILL BE MAILED MARCH 2019. For each $40 donation, you'll receive blessings, gratitude and your very own copy of Farmer cookbook. 80 delicious, hearty recipes and beautiful yarns from the land. And a few photos of dogs! Donation includes the cost of postage. Not everyone wants a cookbook, we get it (kinda!). But we know that so many people care and want to do a little something to help.